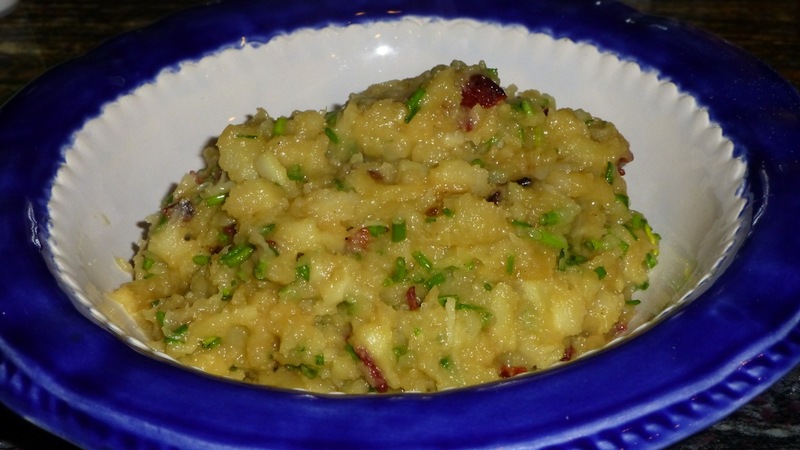 These Mashed Parsnips are a good side to any meal — even served at a picnic in place of mashed potatoes or potato salad. The ingredients are fairly straightforward. Oops, I forgot to show the turkey bacon but it is listed in the recipe below. You’ll be peeling, slicing then cutting the parsnps in half if they are large pieces. I like to have most of my pieces be the same size so they all are done around the same time. Next put them in a medium pot and boil them. Outside of frying the bacon, those are the major instructions so it’s pretty simple. The one thing I would do differently (so I’ve adjusted the recipe) is to use less chicken broth as 2 cups of broth made the mashed parsnips taste more like chicken than parsnips. Not good if you happen to like the taste of parsnips. And, it made them taste really heavy in the belly. With that change, I think this recipe would be really really good. Ready to try it? 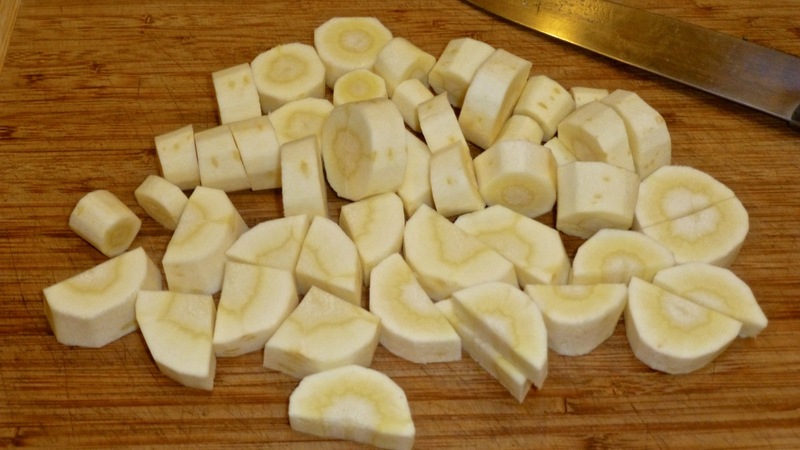 Place the parsnip chunks in a medium sized pot. 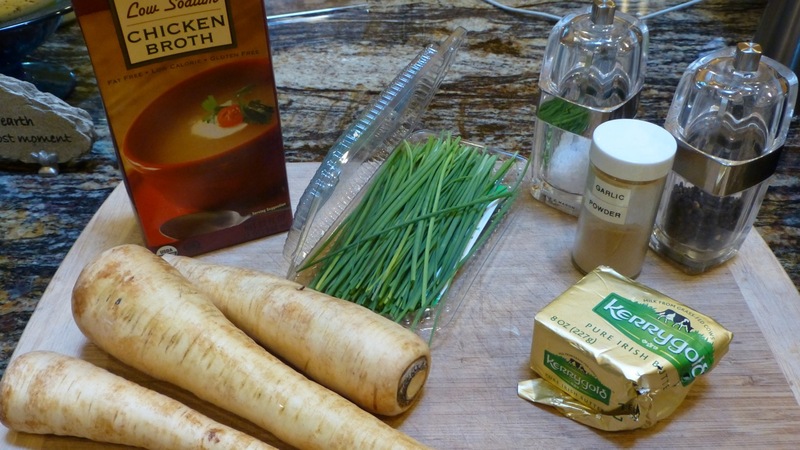 Pour the chicken broth and water over the parsnips. Bring the parsnips to a boil over medium high heat. 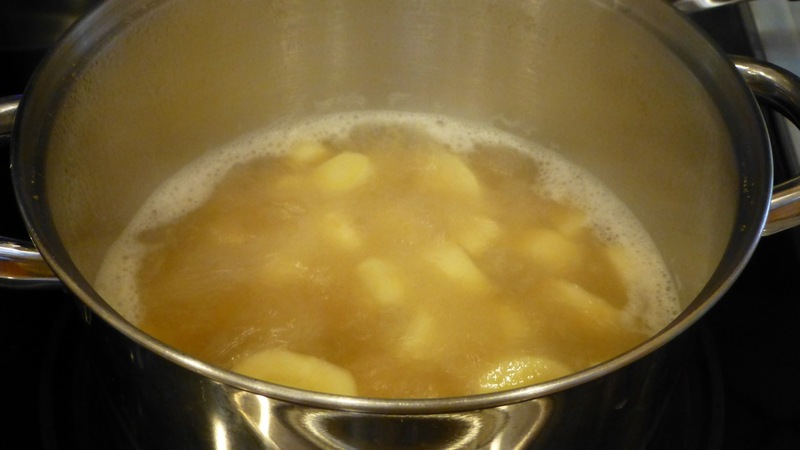 Keep boiling over medium high heat until all or most of the liquid has evaporated — about 20 – 25 minutes. Once all or most of the liquid has evaporated, turn off the heat then add your butter, salt, pepper and garlic powder. Mash the parsnips until you reach your desired consistency. Add in the bacon and chives and stir until all is blended together. That’s it! Here’s the finished product.